Kids in Norway wouldn't know a good egg if it hit them right in the dumb high cheekboned Nordic faces. One company has offered a creative suggestion for dealing with Norway's pediatric ovo finickiness problem: eggs specifically marketed to boys and girls. 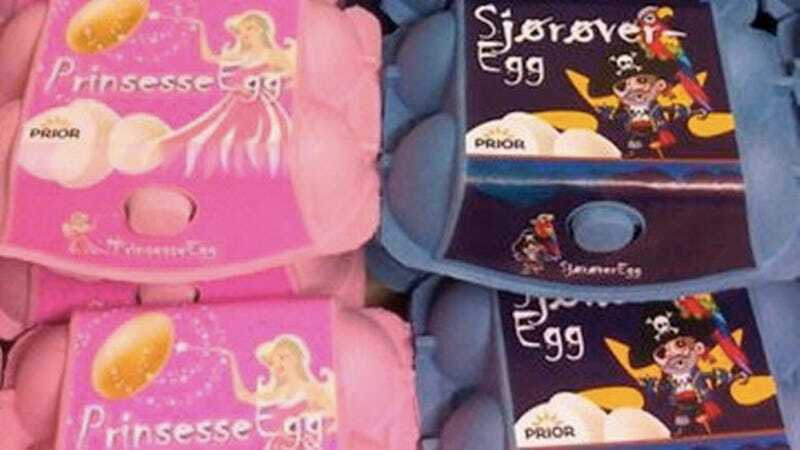 "Princess Eggs" and "Pirate Eggs" promise to shove breakfast protein down kids' throats and wash it down with some enforced binary gender identity. And while some of you may think this is a terrible idea (kids should be free to be themselves why are we teaching kids early that girls are gentle pink bubbles and boys are domineering buccaneers bla bla bla bla bla), I can think of no better way to get a picky little girl to eat eggs than to promise them that inside every shell is a liquified dead baby princess.